Ride Safe bracelets allow you to conveniently display your personal information in case you are ever in an emergency with your horse. 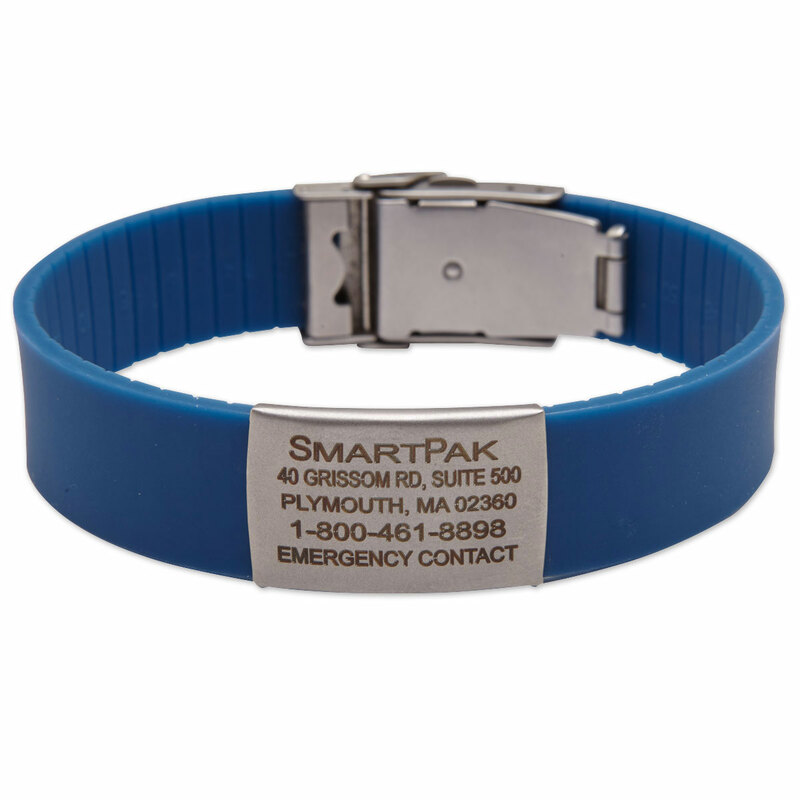 Each bracelet has an ID number located on the back of the plate which can unlock your medical profile to expedite care. 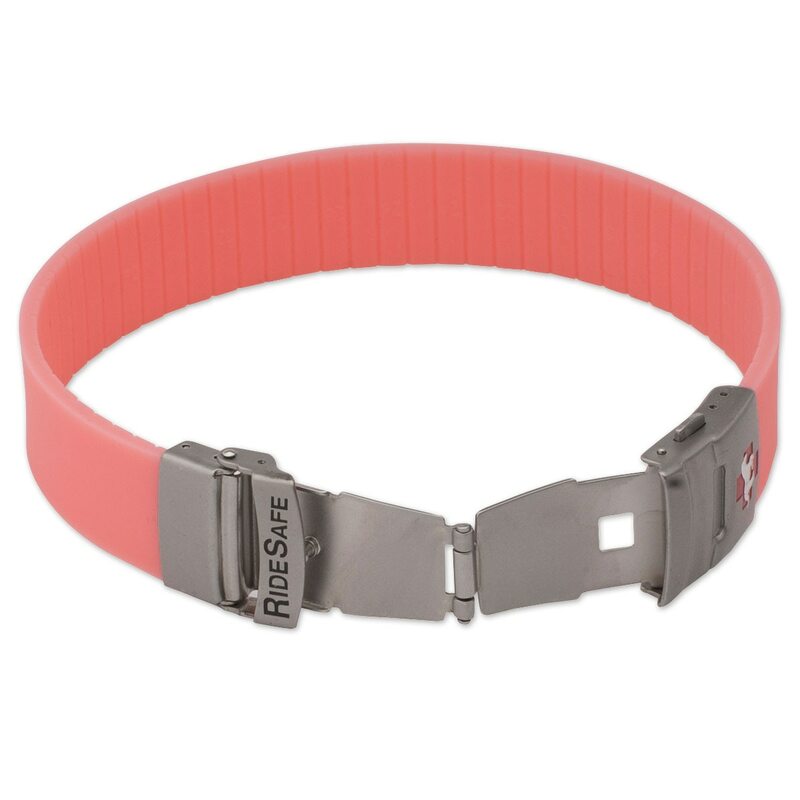 These attractive bracelets are available in a variety of colors and are made from 100% medical grade silicone with a stainless steel buckle, clasp and ID plate. 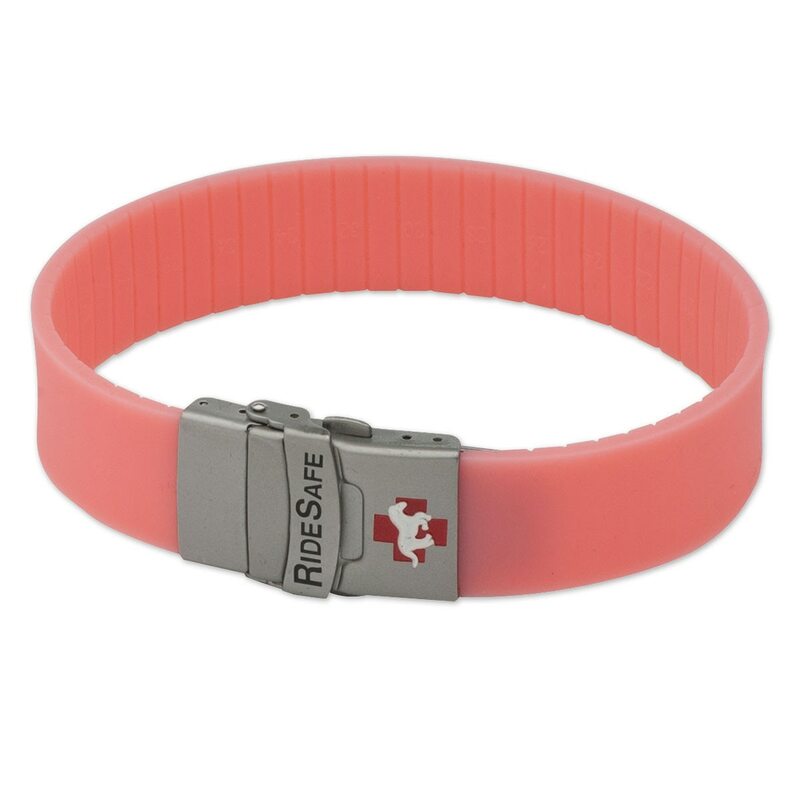 Click "Get Started" above to select your band color and get your personal information laser engraved. Up to 5 lines of text is included on your bracelet. Text on your bracelet is your choice for all lines, please click on the customization link for suggestions on what you can include on each line. Ride Safe Bracelet is rated 4.4 out of 5 by 8. Rated 4 out of 5 by Anne from It was a bit difficult to get all the information I needed on it but managed. My daughter loves it. Rated 1 out of 5 by hmz13 from Never got it and my supplement issue Bought this in August but never received. Went around with company multiple times and still hadn’t gotten it by November so I had my money refunded. Looks really nice I think I would have liked it but very frustrated when I was told it was delivered September 13. (It wasnt) and then told maybe my mail had been taken. (I live in the middle of nowhere and shop EVERYTHING online and never missing a package) At this point I was told a replacement would be sent immediately. Still never received it and called again to track it. Never got sent. I then just asked for a refund as I was tired of the run around and to also suspend my bug off smartpaks since it was winter. They said I was being sent another supplement in lieu of bug off for wInter. I never approved this change!!!! I decided to then just cancel my smart ship. i liked the supplement but irritated they would change it without my permission. I’ve never complained about a company before but this is unacceptable business. Rated 5 out of 5 by NCEventer from So much better than the old armbands I bought this a couple months ago and absolutely love it. I got in in my Eventing colors. So much more comfortable than the old armbands. I also use it for running. It's great that you can update your information online. Rated 5 out of 5 by Mars88 from Love the smartpak has ridesafe So happy to see smartpak carrying ridesafe braclets now! I love them! So much more comfortable than the old arm bands that fall down constantly! And I can wear the bracelet all the time - so it really can serve as a medical alert bracelet (even if your not riding!) - well worth buying! Rated 5 out of 5 by Lizzy from Amazing substitution for the medical arm band I bought this to substitute the unfashionable armband, and I love it! Rated 5 out of 5 by Welshcob girl from Love the safety of it I really like the fact that when I am riding or working with other people's horses, my medical information is available should anything happen. Rated 5 out of 5 by Djnadeau from So great! Makes me feel safe! I ordered one of these bracelets from the RideSafe website and I love it! They are fully adjustable to every size and it makes me feel more secure when riding, in case of an accident. In fact, I also wear it when I do other high risk activities, including flying. The only drawback is that people aren't educated about looking on the back to check for a number, or know to look on a website to get a medical history. I do however love that my medical conditions and contact info is readily available on the front in an emergency!